As I write this I’m looking out my window at a beautiful sunny day. Temperatures are in the 70’s and there’s a bit of a breeze. I’m so excited!!! This time of year thoughts turn to spending time outside and making fun, bright foods, like lemony treats. I like to sip on real fresh lemonade every once in awhile and the kids get a kick making it with me. That is exactly what came to mind when I took a bite of these delicious Lemon Sugar Cookies. 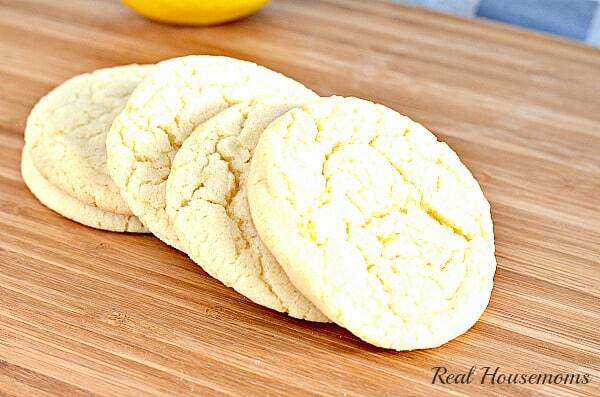 Lemon Sugar Cookies are the perfect spring or summer sugar cookie. They’ve got so much lemon flavor with the lemon extract AND fresh lemon zest. I loved that you could see the flecks of lemon zest in the cookies too. The edge of the cookies is a bit crispy but the inside is perfectly chewy, and the chewiness lasted a few days too! I was going to be good and only have one and then give the rest away but then I had another, and another, and another until I had a stomach ache. I had absolutely NO self control when it came to these Lemon Sugar Cookies. Lemon Sugar Cookies are like lemonade in a cookie! They're amazing and so easy to make with lots of fresh lemon flavor! Hi, Just wondering why the lemon extract and not juice, does the juice not provide enough flavour? or too much liquid? I like the strong lemon flavor that the lemon extract provides. Hi. What if you can’t get lemon extract? It’s not available in NZ. Is juice ok to use instead? These look good 🙂 can i use fresh lemon juice instead of extract? I would use both. The lemon juice isn’t going to be as strong, or if you don’t have any you could probably increase the lemon zest. Thanks so much.I like cookie so much.Thanks for sharing. I’m glad that you liked them. These sound amazing! My daughter and I will be making these soon! I’ve already made 3 batches of these, and they seem to disappear overnight. Today, I’ve got another batch in – with a little change. I’m using orange zest and pure orange extract. The extract is from Nielsen-Massey Vanillas, Inc and I found it at Sur La Table. They are wonderful, and I know I will be making them again. Very good! Will definitely make again! If I wanted to do cut out shapes would I need to add more flour? What do you do if you do not have the lemon zest ?? These sound amazing. I am a lemon fan. Printed the recipe and looking forward to making them this weekend. Thank you for sharing your recipe for us to enjoy. I am a serious lemon fan. I saw this and must say, it sounds amazing. I have printed the recipe and am looking forward to making them this weekend. Thank you for sharing for us to also enjoy. Great cookies’ Best ever lemon sugar cookies. Could I substitute oil for the butter? You’ll get a different consistency in your cookie. It’s up to your if you want to give it a shot. It would probably be better to substitute Crisco rather than oil. The oil will most likely cause the cookies to flatten out. I made these the other day and I love them! 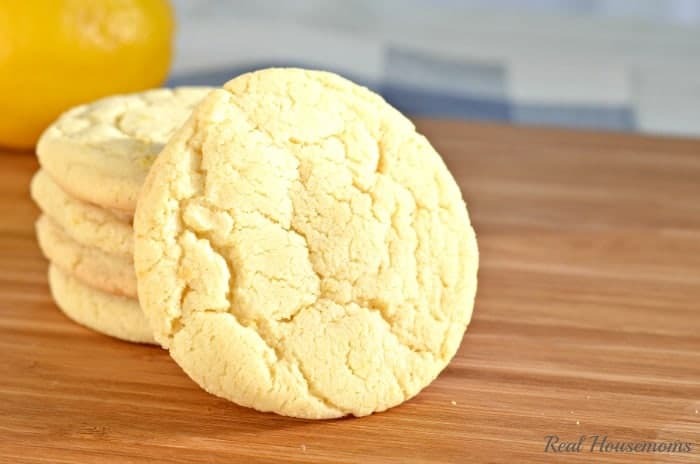 I am not really a lemon person because of the tartness, but these cookies are so good I am making them again today (my family devoured them over two days)! Thank you for sharing! We’re so glad you enjoyed them! Thank you for writing in to let us know! 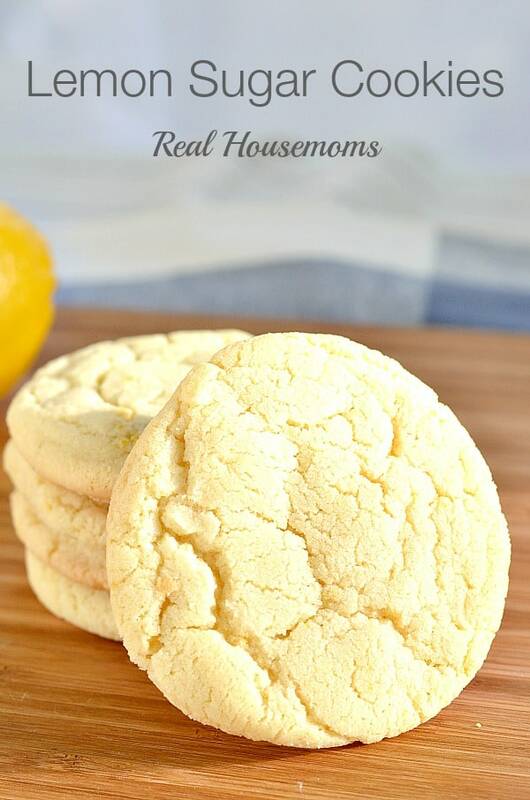 My husband loves these cookies topped them with lemon sugar. I made these cookies and I used lemon, maple extract and lemon zest. I rolled them in colored sugar and they came out great. So so so good. I didn’t have any lemon zest on hand and didn’t feel like going to the store so I used 1 1/2 tsp lemon juice instead. I also used 1/2 tsp butter flavor extract and 1/2 tsp vanilla since I was almost out of the vanilla lol. (Spontaneous cookie baking at its best lol) anyway…I did chill the dough for about an hour because it was just a little wet due to the lemon juice. Then I used the lemon extract to flavor some sugar and rolled the balls in that before baking. Omg so so so good! Thank you for the recipe! Great recipe. I added about one and a half cups of white chocolate chips. Ooooo! I’ll have to try that next time! The cookie is great, but not very lemony. I will make again, but will increase the lemon extract by 1/2 tsp., and add more lemon zest. That’s the trick! Thanks Barb. I’ve made this recipe many times and everyone loves it! I love the sweet and tart combinations and it’s so easy to make! One of my favorites as well!! Thank you Brittany. These are the best sugar cookies I’ve made yet! So quick and easy. I didn’t have the lemon extract, so I substituted lemon juice and added zest and they are delightful! Thank you ? I made these for a class project and they were a big hit! Everyone loved them! Thanks for sharing this awesome recipe!